Coramba farmer Wayne Duver cuts production time by 50% with innovative gadget that's gaining customers this festive season. Wayne inspects a baby pine tree that has another three or four years to go before harvest. As the trees grow, Wayne picks a ‘leader’ branch and prunes around the edges to help the tree grow straight. Photography: Gethin Coles. NESTLED in the hills of Coramba in the NSW North Coast region, Wayne Duver tends to his beloved crop of Radiata pine trees beneath moody skies and a fresh breeze that smells of Christmas. Like a barber in his salon, Wayne prunes with precision yet wastes no time with his sweeping secateurs sculpting his trees and leaving a trail of pine needles as he goes. For many, the humble pine tree is the pinnacle of the festive season surrounded in gifts and bejewelled by families in great anticipation of the big day. But for Wayne and his wife Christine it’s a three-to-four-year wait: growing, pruning and perfecting Christmas trees to ensure customers receive them in tiptop condition. This niche skill has become second nature and as the three-week rush of Christmas nears, business is shaping up. In an effort to preserve quality and labour, the Duvers invested in a Danish Christmas tree packaging machine, the Net-Let, three years ago. Wayne says his order marked the company’s first delivery to Australia. The space-age-looking machine bears three sized rings (small, medium and large) and is hooked onto the back of the tractor. It envelopes each tree with netting, shrinking it to a third of the original tree size. The clever invention has helped cut production cost per tree, increased supply chain efficiencies and is boosting sales. “It’s made a huge difference on quality and transportation time and the end user is getting a much better product,” Wayne says. “When we first started we could only get 45-50 trees onto our truck and trailer, otherwise you’d cause damage, but now with the wrapping machine we can get up to 120 trees. So instead of doing two loads I’ve only got to do one.” In turn their business, North Coast Christmas Trees, has grown 25-30% year-on-year since creation. The Danish-designed Christmas tree wrapping machine, the Net-Let, is helping Wayne cut production time, preserve quality and boost business. Now the Duvers have 6,000 Christmas trees, spanning 10 hectares on their 50ha farm. The property is open to the public from 1 December each year to come and choose their very own tree. The trees are sold in three sizes ranging from 1.2m to 2.4m and cost between $50 and $85 each. “It’s a matter of seeding, fertilising and tending for three-to-four years before you get any money back.” So it’s hard to imagine how such a short window in the year could be profitable on small acreage. But to their credit, the Duvers have focused on what they’re good at; a low-maintenance cash crop with innovation at the core, backed with a little off-farm income during off-peak periods. It takes six weeks to prune the entire crop, which Wayne does himself twice a year. North Coast Christmas Trees outsources the majority of deliveries, unless it’s local or delivering to Queensland, in which case Wayne drives once a week during the Christmas period. When the farm gates open on 1 December, the Duvers can see up to 200 visitors a day. Shopping for Christmas trees in the paddock is certainly different to the inside of a department store, so it’s not surprising their farmgate experience makes up 60% of their sales (the remaining sales are to outlets). Customers love coming out to the farm and enjoying the country experience, he says. One way of expanding their reach has been through online marketing. The Duvers have recently updated their website with e-commerce capabilities and they have used social media advertising to help drive sales, which is proving a success. 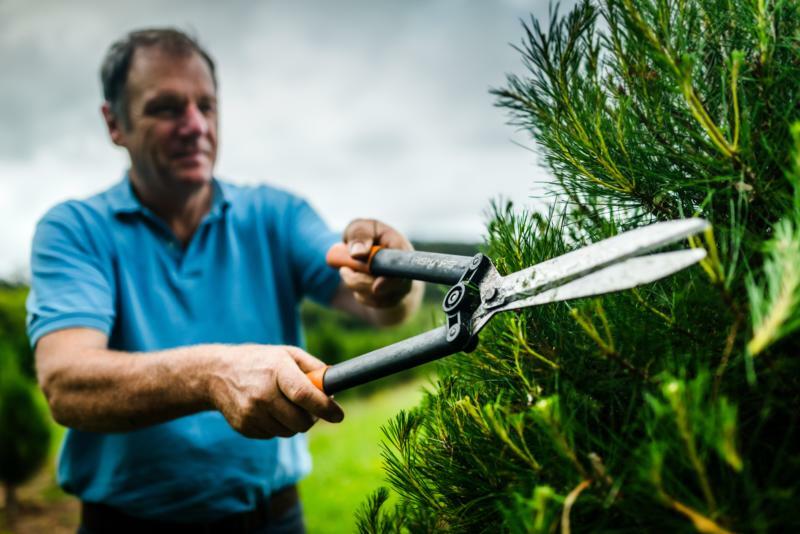 The Coffs Harbour climate is perfect for growing Christmas trees, Wayne says. Environment is becoming more important for consumers. 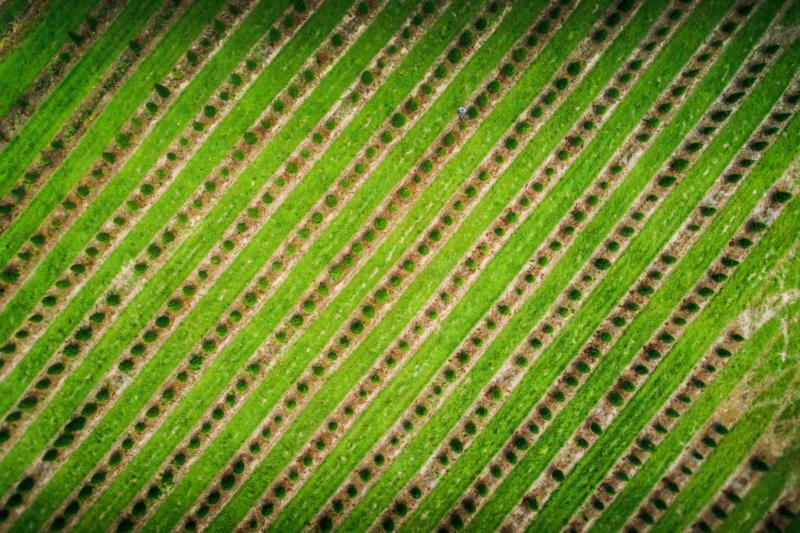 “We’re getting more and more questions about the effects of growing our trees on the environment and at the moment we’re pretty much replacing what we take out, so we’re carbon neutral, really. Wayne says they are getting a lot of repeat customers. “All farmers should integrate social media into their business for value-adding. It’s a way of telling your story and showing your point of difference, otherwise we’ll all be swallowed up by corporates. Wayne inspects a baby pine tree that has another three or four years to go before harvest. As the trees grow, the farmer picks a ‘leader’ branch and prunes around the edges to help the tree grow straight. Care for it in the same way you would care for a bunch of flowers. Trees may drink between one-to-four litres of water per day, so make sure you check daily and supply fresh water as needed. Cut 2cm off the stump of your tree and put it into a water stand – this opens up the tree trunk to water. A large bucket filled with stones and water works well as a water stand.